On my way to work this morning, I saw a car stopped by the side of the road. A woman was walking towards a section of tall, scruffy weeds with a small plastic bucket in her hand. I had to smile; I know exactly what she was doing. My husband and I do the same thing. She was stopping to pick wild blackberries. Late June to early July is the time to be on alert for a roadside harvest. I’ve seen folks on the side of an interstate highway, backsides of all sizes and shapes towards the traffic, focused on picking the sweet, dark berries. You can find them in overgrown areas next to railroad tracks, woods around a business or, lucky me, in the neighborhood where I live. I’ve been watching them grow for several weeks, making a pass by the different patches as I walk. It helps to know what you are looking for and you have to pay attention to timing,because the birds may beat you to them. 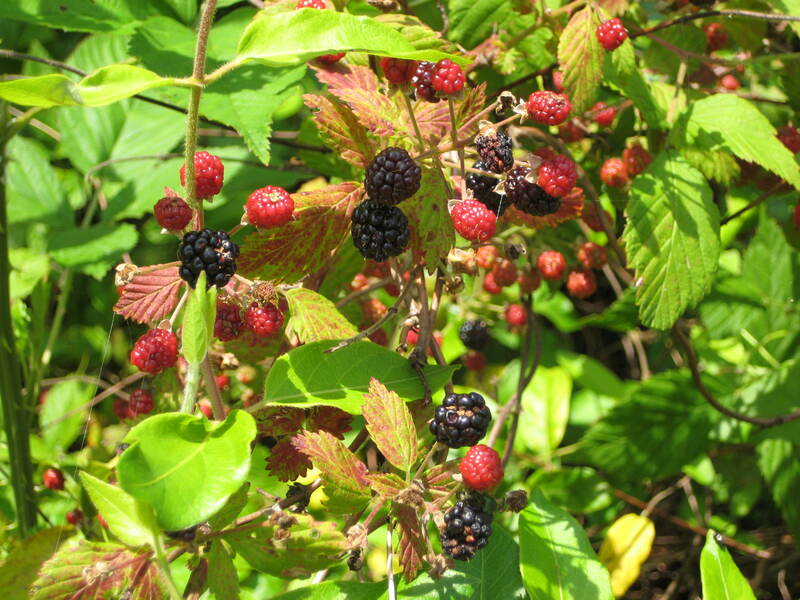 Wild blackberries are usually smaller, but when they ripen, they are just as sweet. Four cups is all you need for the blackberry cobbler recipe below, easily gathered in 2 16-ounce plastic cups. It’s possible you’ll end up looking like you’ve been in a cat fight, but it’s worth the sacrifice. Really, there is just nothing better than homemade blackberry cobbler. Wash them gently, dry and freeze them and this winter when it’s cold and gray outside you can reclaim the taste of a sweet summer roadside harvest. Preheat oven to 375. Place 4 cups of blackberries in a lightly greased 8-inch square baking dish. Sprinkle with 1 Tbsp. of lemon juice. Stir together 1 large egg, 1 cup sugar, and 1 cup all-purpose flour in a medium bowl until the mixture resembles coarse meal. Sprinkle over the fruit. Drizzle 6 Tbsp. of melted butter over the topping. Bake at 375 for 35 minutes or until lightly browned and bubbly. Let stand 10 minutes. Serve warm with whipped cream or ice cream if desired. Makes 6 servings.